This card features the coolest stickers! These are not just any stickers, these are Elizabeth Craft Peel Off Stickers. These are vinyl stickers that are very versatile. I used a butterfly sticker that started out as gold, however it didn't match with my card so I colored it with a black copic marker before I peeled it off with my tweezers. Once it was peeled off I stuck it to some stained glass holographic paper. You could use any kind of paper you wanted behind it. You could even use Christmas holographic wrap that you can find at most dollar stores and have the same effect. I added a single rhinestone for the head. It was so quick and easy to make this unique embellishment! The photo doesn't do it justice! The image I used is Poppy Background by Hero Arts. 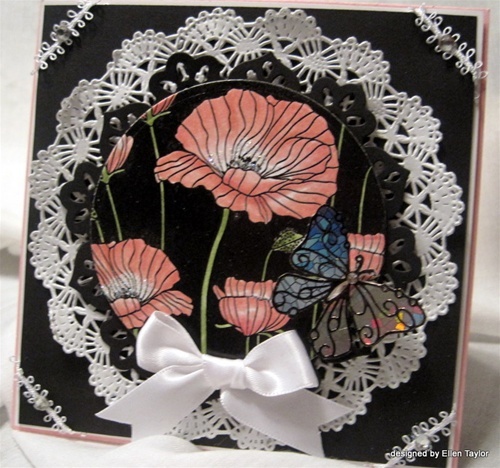 I stamped it in versamark and embossed it with black embossing powder. I colored this with regular water based markers using 3 shades of pink and two greens. I first started by directly coloring the lightest shade on the poppies. Then coloring with the middle shade, not covering everything I had just colored. Blend with the lightest shade. Next, pick up the darkest color using the lightest marker, by touching tip to tip and color in the darkest areas. Coloring with markers this way can give you a graduated blended look, much like copics. . My tip for coloring is to not push too hard when coloring. This will keep your markers in fabulous coloring condition as well as a smoother colored image. 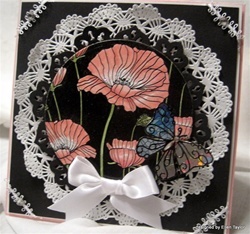 Once my image was colored I cut it out with Circle Nestablities then popped it up on Spellbinders Floral Doily Motifs. This is the part you can all laugh at me for..... I get my Paper Doilies from the restaurant I go to for lunch with my girlfriends. The Waitress is kind enough to give me a stack every now and then. A good tip goes a long way sometimes. I added dollar store ribbon to the corners and some rhinestones. Finished it off with a white satin bow and a wee bit of glitter in the flower centers.